The RCMS490 series provides ground-fault monitoring for up to twelve separate systems or channels in grounded and high-resistance grounded, AC/DC, single-phase or three-phase systems. The RCMS490 is also compatible with systems that contain power conversion equipment, such as variable frequency drives. Each channel has an independently adjustable trip value. For AC systems, the trip value is adjustable from 6 mA to 20 A. For DC and mixed AC/DC systems, the trip value is adjustable from 10 mA to 10 A. Each channel is individually monitored with a connected current transformer, available in a wide range of sizes, shapes, and core types. Three separate time delays are available - a pickup delay, startup delay, and delay on reset. Advanced harmonics analysis and filtering options allow for tailoring use to specific application requirements. The on-board LCD display shows a detailed system overview, including a chart showing measured ground-fault current in real-time, individual alarm messages for each channel, and an easy-to-use menu for adjusting settings. Advanced harmonics analysis and filtering options allow for tailoring the relay's monitoring capabilities to specific application requirements. Two configurable Form-C (SPDT) ouputs trigger on alarm activation. Additionally, each channel has an individual Form-A (SPST) output. 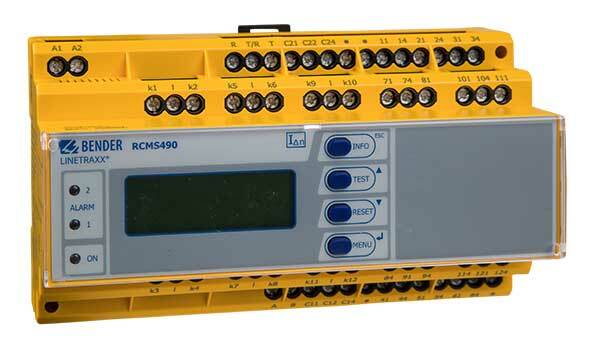 The RCMS490 is compatible with Bender's communication gateways for connecting to Ethernet and Modbus networks.